Stephen Devassy Mmusic director profile and biography is given here. 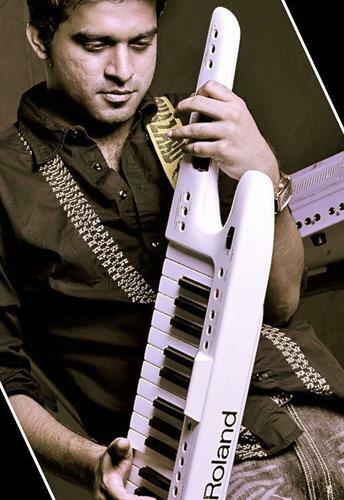 Stephan Devassy is both a pianist and a keyboard player. He rose to fame through his experiments with fusion music. Many of the albums were based on the novel treatments of Indian ragas with the corresponding ragas from the Western style of music. Later, he also forayed into the art of composing Malayalam movie songs. Before making his music directorial ventures, he had also arranged music for some of the songs in Malayalam movies. Stephen Devassy is an accomplished piano player and a music director in South India. He often used to think of building on his strength from scratch. In accordance with this point of view, he slogged hard to reach the point where he is today. During his childhood days, he used to perform on keyboard in a church nearer to his house. The keyboard performances in the church gave him the confidence to dive deep into the ocean of music and to perform before the public. Looking at the innate talent in his son, his father P.K. Devassy gave him a keyboard to play the music on. The Stephen had learned to play the keyboard when he was studying in the fifth standard. By the age of 12 years, he became confident enough to perform before an invited audience. His association with the Christian institutions grew to such a level that he became a regular feature in a church band by the name Rexband. This band sang gospel songs on many occasions in the local church. From small-time participations, he grew in stature to become a music director in the Malayalam film industry. Stephan Devassy was born on February 23, 1981 to an Ottapaalam-settled Christian family in Kerala state. His father's name was P.K. Devassy. He did his schooling from 7th day Adventist School at Ottapaalam in Palaghat district of Kerala. His association with this school helped him to learn the basics of Western Music. After getting the keyboard as a gift from his dad, he began learning the instrument at the tender age of 10 years. With his instrument, he began performing in a nearby church on many occasions. Hence, he grew in confidence in his presentations before the public. When he became 12 or 13 years old, he grew so confident that he performed before a selected audience without any hassle. After passing the SSLC examination, Stephan Devassy joined Ottapaalam-based N.S.S. College for doing his pre-degree course. At this stage, he was almost decided on his career in music. This gave him much needed motivation to develop himself as a musician. When he was in the first year of the pre-degree course, he got an opportunity to embark on a foreign tour with the noted singer Hariharan. At the age of 16 years, he created a record of sorts when he got a degree in music from Trinity College, London. This gave him much needed moral boost to actively pursue his interest in music. His keyboard teacher was Leslie Peter. After learning keyboard, he began to show interest in piano. In order to further his interest in learning piano, he trained himself under the able tutelage of Father Chakalamattah at Chethana Academy of Music in Trichur. Stephan was also interested in the activities organized by the National Cadet Corps (N.C.C.). Due to his passion for doing social work and good track record as an N.C.C. volunteer, he was selected to represent the state in the Republic day of the country during the year 1998. He still regards this as one of the recognitions he has got in his life. Stephan Devassy's first break in the field of music came when he was 18 years old. For an album Ishtamannu, he created and compiled six songs. This album was created for a person by the name Jonny Sagarika. The album did make a good impact in the market, and it was liked by many accomplished artists in the industry. After this, he accompanied veteran singer Hariharan on his European tour as a keyboard player. That foreign tour did provide much needed exposure for him to mature into a well-matured artist. His performance with the singer Hariharan was a game changer for him. Because of this, another veteran artist Dr. L. Subramaniam requested him to accompany him in his music concert at the Lakshminarayana Global Music Festival. At the age of 19 years, he formed a band called 'Seven' with singers Franco Simon and Sangeeth. This band had released a Hindi album titled Yeh Zindagani. During his formative years, he was influenced by the variety of music created by the famous musician and music director A. R. Rahman. His approach to make a variety in music was liked by him. Hence, he tried to inculcate the same concept in his experimentation with the fusion music. Stephan is also a regular member of a band titled Rexband, which is a Christian Contemporary band singing gospel fusion in local churches. This band was formed as a musical outreach of the Jesus Youth Movement. Fortunately, he got an opportunity to perform before Pope John Paul II with his band in the year 2002. It was on the occasion of World Youth Day in Canada. At that point in time, he was orchestrating an instrumental version of popular Rexband melodies titled Different Vibes before the Pope. Because of this, he got into the limelight and his popularity rose. He also had done solo stage performances in various platforms. Because of his unique way of experimenting with music, he found himself amongst the top league of on-stage performers of the region. Due to this, his popularity as an instrumentalist grew, and he started featuring in various TV channels in the states of Kerala and Tamil Nadu. In one such program called AirTel Super Singer 2008, he played piano for both the contestants and playback singers. While working with Rexband, Stephan Devassy made music arrangement for several films. Some of the films for which he composed music include Majaa, Nammal, Thambi, Waqt Par Bolna, and Azhagiya Thamizh Magan. However, his first music directorial venture was for the movie Hariharan Pillai Happy Aanu. Under the banner of Kosmic music, Stephan had set to the tune the Sanskrit slokas, mantras, and versus from Upanishads against the background of Western Classical Music, a first of this kind in the state. This album was titled as Sacred Chants of Kosmic Music. He had also set the sacred chants of Lords Ganesha, Shiva and Vishnu against the captivating Western music to earn the appreciations of the music lovers. In association with Sarod Maestro Amjad Ali Khan, he set the tune for albums Christmas Carols and Breaking Barriers. Working with other artists, Stephan Devassy released a new experiment in music called Romanza. In this experimental album, he had employed a mix of world music, which was sprinkled with the flavor of piano. The album featured the artists like Hariharan, a Russian vocalist and Ouseppachan to help rediscover the Indian ragas with the help of the piano. Again this album was a unique piece of fusion music that took the audience to a totally new level of experience. Since he was interested in social welfare activities as evident from his participation in N.C.C. programs, he took special interest in philanthropic activities. Thus, Stephan Devassy performed at Shakthi Foundation's annual fundraising concert alongside the music greats like Zakir Hussain, Sivamani, U. Srinivas, and Dominique Piazza. Apart from these, he participated as a reputed pianist in cultural festivals of various educational institutes. Of late, he has appeared as a pianist in a popular music reality show on Mazhavil Manorama television channel. As pointed out earlier, Stephan Devassy was the first Indian at that point in time to pass with distinction a degree course on Music from Trinity College of Music, London. He completed this course with 92.2% marks in three years' time. Due to his international exposure and training in music, especially the Western Classical and Contemporary Music, he experimented with fusion music. In this novel approach, he played with the Indian and Western ragas, and created some of the masterpieces that have stood the test of time. Because of these novel methods of creating fusion music, he won recognitions from both the country and abroad. Many of his albums were based upon the fusion music and they really created movements in the market. Hence, multiple copies of these albums had to be printed to meet the demands of the people. Stephan Devassy is an accomplished pianist, a keyboard player and a music director. He accomplished the stature of a musician by merely following his passion for music. During his formative years, he was trained on the instruments like keyboard and piano. Moreover, he used to take part in bands that were formed as part of Jesus Youth Foundation. One such band to be formed was Rexband. With this band, he had the rare distinction of performing before Pope John Paul II, as part of the World Youth Day festival in Canada. When the band was selected to perform before the Pope, it was the only Catholic band to be selected from India. Later, he attempted to do better as a music director and composed the music for two films in Malayalam movie industry. Apart from these, he was also instrumental in making fusion music. Some of his fusion music albums were based on aesthetic treatment of Indian ragas with the likes from Western Classical and Contemporary music. The fusion albums were huge hit in the market. M A Yusuffali has been appointed as the new mediator to solve the problems the Smart City Kochi is facing at present and salvage the issue. He is an astute businessman and is the managing director of the Emke Group as well as the Director of the Kochi International airport. Check this article for Swetha Menon- Actress Swetha Menon's Profile, Swetha Menon's wiki facebook profile, Swetha Menon's Photos,Swetha Menon's Latest Movies, Swetha Menon's Biography,Swetha Menon's Filmography etc. Check out this article to know about Swetha Menon Malayalam Actress Biography, Swetha Menon Filmography and Swetha Menon Career Profile, Swetha Menon Modelling Career. Hazel Keech Bollywood Actress Profile , Biography,Videos and Pictures is updated here. Hazel Keech or Rose Dawn popular Indian Film Actress has done movies like Billa (Tamil),Body Guard(Hindi),Harry Potter (English) and hazel keech had been in sprite ads too. Hazel Keech or Rose Dawn new sensation in the Mumbai film industry Bollywood, Hazel Keech the 24 year old girl is in news for her relationship with the most elegant bachelor of Bollywood Mr Salman Khan. Sallu who broke up with Katrina Kaif recently is currently romancing the New girl to bollywood Hazel Keech, She is doing role of second heroin in Sallu’s latest movie Body Guard Remake of Malayalam Movie with same Title. She seems to have won the “Wanted “man’s heart, who was in umpteen romances.